Elemental witch Pepper McKay and former Navy SEAL Lathen Quartz have built Lobster Cove Wildlife Rescue and Rehabilitation Center on enchanted McKay land. During a romantic interlude on Halloween night, Pepper happily agrees to become Lathen’s wife. What better day than the winter solstice for their wedding in a town that loves celebrations and Christmas. However, planning a wedding and operating their wildlife center takes a toll on both Pepper and Lathen. When the couple takes a much-needed break for Thanksgiving with family in Colorado, a Maine snowstorm fills the center with injured wildlife. Lathen finds himself drawn into a covert military mission while trying to deal with issues with friends and family. Pepper wants to cancel the wedding. Is she having second thoughts? Will the nosy McKay ghosts, Lathen's werewolf pack, Pepper's parents, and her best friend help or hinder the wedding and holiday plans? I liked this book. This story became slow at times but kept me engaged once I got into it. I really think I would have enjoyed it more if I had read the first book in this series beforehand. The narration was good. This was my first book by this author and I would have no problems listening to the other books in this series. I was given this free review copy audiobook at my request and have voluntarily left this review. I'm having a hard time with this one. This is book 2 in the series and I have not read book 1 so I'm not sure if that is something that is making this review harder than I thought or not. Let's start with I love Christmas Stories, they usually capture me right away, this one however did not, although I can't be sure if its because it summer and I'm really not into the snowy novels yet or if I just couldn't connect with the characters. The animal centre is a noble cause but like Lathan working with the government - I felt that everything was just a bit to skimmed over. Lathan is working for the government & then he just isn't. I think things could've been expanded just a little more. The ghosts...I haven't decided if they are annoying, nosey, comical or all of the above! Crazy characters tho! If you are going to judge this book on my review...please keep in mind that I have not read the first book and its about snowy weather & we are in the middle of a heat wave. This was a great paranormal cozy. It had a great combination of mystery, romance and suspense. The narrator has done a wonderful job of reading this book. The author has done a great job of writing and building the characters in this book. So much more than I expected!!! This is my first listen by Tena Stetler, and I was greatly impressed. I loved how the author wove so much into the book. The plot of the book was great, the suspense was an added plus, the imagery was outstanding, and the characters were endearing. Kalena Schubert did an awesome performance with the various characters giving them distinguishable voices. I requested this review copy audiobook and have voluntarily written this review. This book is a standalone listen and part of a series. I really enjoyed how the author had a witch, a werewolf, a ghost and an animal rescue all in one book. I will definitely listen to more books by this author and narrator. I got this story via audiobook boom and this is my voluntary review. I thought I was not going to like this story but the more I listened the more I enjoyed it. A witch and a werewolf wow! The family as secondary characters was great. Loved how the paranormal aspects were introduced to the ones who didn't know and their reactions. The family dynamics were very effective. The narrator did justice to the story. The story was complete but seemed to be part of a series and many things were alluded to that happened before that made me think there was a book before this one. That did not take away from the story but just gave some background that would have been part of the love story. Loved that the ghosts were a part of the wedding. Humor was used wisely in this story as well. What do you have when you mix an Elemental Witch and animal lover with an Ex Navy Seal who just happens to be a werewolf? A fiery love affair set in beautiful Lobster Cove. The animal welfare is a concern to both Pepper and Latham and keeps them hopping especially when it appears that they also have two resident ghosts which also consider the wildlife sanctuary home. If you are looking for a read that is filled with suspense action and love then this book is what you are looking for. I found it to be a charming read. 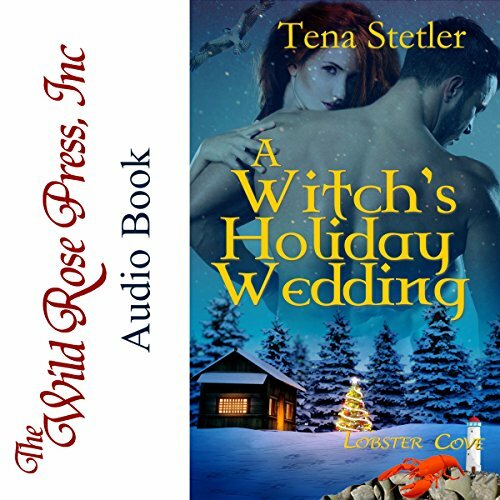 Pepper, witch and local wildlife habitat owner, and Lathen, her werewolf fiancé and former SEAL turned handyman, are off on another adventurous ride in A Witch's Holiday Wedding. Poor Pepper is running herself ragged between the day to day of the LCWRRC, holiday preparations and the wedding planning. Add in some surprise twists that lead to sometimes lengthy turns, it is amazing she is still sane. This was a nice addition to the Lobster Cover series that contains a little bit of steam and plenty of stumbles for the couple to overcome.